Your source for quality hardwoods, Pine and specialty woods. Hardwoods burn hotter and longer than softwoods species like Pine, but softwoods are easier to light. If you’re using wood to heat your home and you have a stove or insert, we recommend Almond or Mixed hardwood. If you have a fireplace, you’ll likely be happier with Eucalyptus or Pine, since these varieties light and burn more easily. We offer a variety of other specialty woods for cooking, smoking, BBQ and heating. If you’re not sure what best suits your needs, visit our FAQ or call us. We’re happy to help you make a decision you’ll be happy with. If you need large quantities of wood for commercial purposes, please call us for pricing and delivery details. On a tight budget? Ask us about Cottonwood. 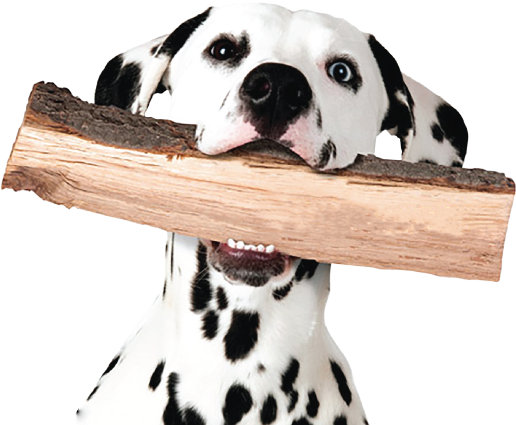 The Firewood Department will usually deliver your order in 1-3 days. We deliver 1/2 cord pallets of firewood using a hummerbee low impact forklift, saving you the time, energy or additional expense of restacking your wood. We serve customers in Reno, Mt. Rose, Galena, Washoe Valley, Carson City, Dayton, Virginia City, Genoa, Minden, Gardnerville, Stateline, South Lake Tahoe, Topaz Lake, Smith Valley, Coleville, Yerington, Walker, Bridgeport, Hawthorn and Markleeville. If you don’t find your location listed, but you’re nearby, call us. Depending on your needs, we’ll do our best to serve you. A modest delivery fee may apply. Customers can always pick up smaller quantities at our yard in Gardnerville, NV, but please call ahead so we can have your order ready. Most of our hardwoods come from the retirement of mature fruit and nut trees. 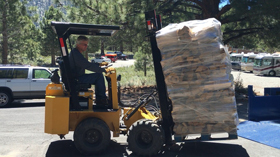 This renewable firewood source has the benefit of serving farmers who need to replant as trees age to maintain the health of their orchards and consumers who enjoy the heat these woods provide. 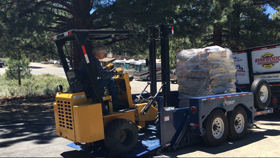 Our Pine is harvested from hazardous fuel reduction projects in the Sierra. If you have a stove or insert, youíll likely enjoy burning Almond or other hardwood. These woods provide hot, long burning fires. If you have a fireplace, Eucalyptus or Pine are better bets. These woods light more easily, so you wonít have to struggle to get a fire going. Eucalyptus, a hardwood, will burn longer than Pine or other softwood varieties. If you’re looking for a lively fire that lasts only a few hours, Pine is an excellent choice. Almond is a great wood for cooking/baking. It doesn’t have a strong flavor, but it creates a hot, even bed of coals that provides consistent results. Many of our restaurant customers have switched from Oak to Almond because of its consistency and quality. For BBQ and smoking, where the wood smoke flavors the food, we offer other specialty woods like Cherry, Apricot and Plum. Each of these woods gives food a different character – it’s just a matter of the chef’s choice. Most campers are familiar with using pine bundles for campfires. Pine is light, easy to handle and easy to get started. It’s a great wood for a few hours of ambience. If you’re looking for more value in your firewood and you’re going to be camping for multiple days, you may prefer burning hardwood. We offer 45# bags of hardwood that are easy to handle and will give you hours of heat and light at your campsite. There are many Oak varieties including Live Oak and Red Oak (36.6 million BTU/cord) as well as Tan Oak, Mountain Oak and Black Oak (27.4 million BTU/cord). Live Oak and Red Oak are difficult to source in our area and renewable hardwoods like Eucalyptus (34.5 million BTU/cord) and Almond (32.9 BTU/cord) offer many of the benefits of Oak without the variability or confusion. We season our hardwoods for 12-18 months. Our pine is cut, split and seasoned for 2 or more months. Because we season our wood in the dry northern Nevada climate, the moisture content of our hardwood is usually about 8-12%, while our Pine is 10-15%. We always carry a moisture tester to deliveries, so we’re happy to give you a reading for your particular delivery. We typically cut our wood into 15-16 inch lengths. Our Hummerbee compact fork lift needs just a few inches of clearance to deliver your pre-stacked pallets. Our ½ cord pallets are 40″ x 48″, pre-stacked 56″-58″ high, so your space needs to be about 4 ½ feet wide by 6 ½ feet high. The standard cord measure is four feet by four feet by 8 feet high. 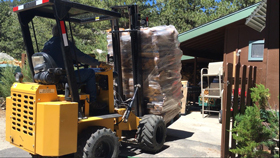 We deliver ½ cord pallets that are 40″ x 48″, pre-stacked 56″-58″ high.